BMW have enjoyed designing the 1-series. You can tell in the way they have been a little bolder in the styling cues of the chunky little Beemer variant. 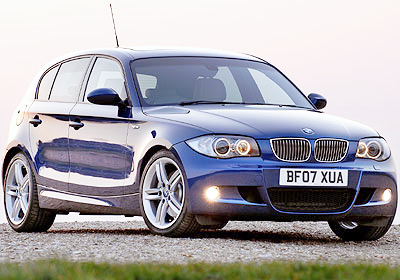 Very sporty and speedy looking, the BMW 1-series has all the visual impact it needs to turn heads your way. The cats like eyes are eye catching, and the big bold kidney grille makes a full-scale visual statement. The 1-series has very little overhang at the front and rear, so first impressions are of a potentially tight, responsive handling hot-hatch. Open up the solid doors, climb inside and shut them with a comforting “thud”. Every BMW 1-series comes with a five star safety rating, so your machine is at the cutting edge of the safety feature package. Let’s look at the 130i safety package a little more closely. There are six airbags inside the interior. This airbag system comprises of two-stage front airbags, side airbags at the front and full-length side “curtain” airbags for the front and rear passengers. The BMW 130i has high strength steel to maximise strength and minimise weight, and the 130i boasts high-strength side impact protectors in all of the doors. All five seats are equipped with three-point inertia-reel safety belts, and there are three headrests at the rear. Occupant safety is enhanced with the belt latch pre-tensioners and belt force limiters. A safety switch interrupts the flow of fuel, unlocks the doors, activates the hazard warning flashers and switches on the interior lights following an accident. The BMW 1-series has the longest wheelbase in the compact class, and it boasts a wide track and an extremely short front overhang. Thus, the BMW 130i Sport provides truly outstanding driving dynamics. The suspension comprises an aluminium double-joint tie bar axle at the front, and a five-arm lightweight steel axle at the rear. The BMW DSC+ stability system has an enhanced range of capabilities, including a dry braking function in wet conditions, pre-loading of brake pads when the driver’s foot is taken abruptly off the accelerator pedal, an anti-fade brake function at high temperatures, Set-Off Assistant that prevents the car from rolling back on a gradient, Dynamic Traction Control Plus (DTC+), Automatic Stability Control (ASC), electronic differential lock, anti-lock braking (ABS), Dynamic Brake Control (DBC), Cornering Brake Control (CBC) and Electronic Brake Force Distribution (EBFD). You will be interested to note that the 130i has the best stopping power in the compact class and is equipped with the BMW two-stage Adaptive Brake Display stoplight system which continuously monitors brake pad wear. The BMW 130i scored the coveted five star safety result in the Euro-NCAP crash test. Slip inside the car, and you’ll note the seats are very sporty and offer plenty of lateral support. And this being a sporty model, means you also get one of the best steering wheels on the market. The side bolsters are electronically adjustable for hugging a range of figure sizes. The driving position is just right, and it has enough adjustability to ensure most figures will be able to relax in comfort. Everything feels nice, and the materials used inside the cabin are first class. The cabin is ergonomically designed well, and there is class written all over the way the cabin is soundly put together. Underway, the engine is very well muted – but not enough to prevent the sweet V6 engine note from tickling the ears when opened to full throttle. Highway cruising is therefore very quiet inside the cabin, and talking, and listening, to friends travelling inside the cabin is a breeze. This car is loaded with luxury items and practical features. A couple of impressive things on offer (for a little extra) is the satellite navigation and the iDrive systems. The iDrive works well, and you can adjust everything from the radio station to the heating controls via the one central control dial which is located between the two front seats. You will enjoy the superb sounding stereo, and the boot is of a decent size for a hatchback. Luggage space will balloon to 1150 litres when you fold the rear seats flat. Very quick on the road, the BMW 130i pumps out 195 kW of power and 315 Nm of torque. The six-speed auto, or manual, gearboxes link the engines authority to the fat low profile rear tyres. Acceleration is awesome, and the 0-100 km/h can be dispatched in just over six seconds. A limited top speed for the BMW 130i is a high 250 km/h. For any more information on the BMW 130i, or for that matter any other new car, contact one of our friendly consultants on 1300 303 181. If you’d like some fleet discount pricing (yes even for private buyers! ), we can submit vehicle quote requests out to our national network of BMW dealers and come back with pricing within 24 hours. Private Fleet – car buying made easy!